A loupe or magnifying glass is a convex lens that is used to help the eye see an object that is difficult to observe directly using the eye. The loupe is called a simple magnifier because it has limited ability to magnifying the image of an object. In the next lesson, you will learn about non-simple magnifiers such as microscopes, etc. When viewed at close range, an object appears large, but when seen from a great distance, it seems small. Close-spaced objects appear large because of the large size of the image of objects formed on the retina. Conversely, the same thing, when viewed from a great distance, seems small because of the image size formed on the retina, small. So the size of an object visible depends on the image size of the object created on the retina. Big or small image of objects created on the retina depend on the angle formed between the eye and the object, as shown in the figure below. Objects that are far away from the eye appear smaller because they have smaller angles (θ) (Figure 1.1). Conversely, objects that are close to the eyes look more significant because they have a larger angle (Figure 1.2). It can be concluded that the object size seen by the eye can be enlarged or reduced by increasing or decreasing the angle (θ). The angle is enlarged by bringing the eye closer to the object. Otherwise, the angle is minimized by keeping the eye away from the object. The above review can be applied to other issues. If you find a alphabet that is so small that you have difficulty reading, what do you do to read the text? Based on the review above, you might bring the alphabet closer to the eye so that the angle formed between the alphabet and the eyes is larger, so the writing becomes larger and can be read. It should be realized that the near point of the normal eye or the closest distance that can be focused on the normal eye is 25 cm therefore if the distance between the alphabet and the eye is smaller than 25 cm the alphabet appears blurry. Alphabet that can be read from a distance of only 25 cm seems blurred when brought closer to the distance between the alphabet and the eyes smaller than 25 cm. Then how to make the alphabet that has a very small font size can be read? Of course you need the help of an optical instrument that can magnifying the alphabet. Optical instrument such as plane mirrors, concave mirrors and convex mirrors cannot be used to read alphabet because the mirror is not transparent. Instead the lens is translucent so it can be used to read alphabet. In the lesson of the image formation by the concave lens, it is explained that a concave lens can only minimize the image of an object. In the topic of the image formation by the convex lens it is explained that a convex lens can magnifying the image of an object, so the convex lens can be designed as a loupe or magnifying glass. In figure 1.3, objects are seen directly using the eye, where objects appear small because of the angle between the eyes and the two ends of the object, small. In figure 1.4, the eye sees objects through a loupe. The loupe functions to form the image and magnifying the image so that what is seen by the eye is an image. The image of the object observed by the eye through the loupe appears more significant because the angle formed between the eye and the two ends of the image is more significant. For the observer’s eye to see the image through the loupe, the image must be virtual (the image is in front of the loupe, or the image is on the same side as the object, as in Figure 1.4). On the topic of the image formation by the convex lens, it has been explained that for the image to be virtual, the object distance (do) must be smaller or equal to the focal length (f). θ = the angle between the lens and the two ends of the object. 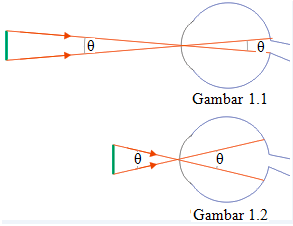 In figure 1.3, the lens in question is the eyepiece, whereas, in figure 1.4, the lens in question is a convex lens that is used as a loupe. In Figure 1.3 (the figure looks sideways), the object is on the left while the observer’s eye is on the right. In Figure 1.4 (the image looks sideways), objects and image of objects produced by a convex lens are on the left while the observer’s eye is on the right. When the object distance (do) equals the focal length (f), the image is virtual and the image distance (di) is at infinite. Infinite is the maximum virtual image distance because the far point of the normal eye is infinite. Instead the minimum virtual image distance is 25 cm because the near point of the normal eye is 25 cm. When the eye sees a virtual image at an infinite distance (distant point), the eyes have a minimum accommodation, or the ciliary muscles of the eye are most relaxed. To achieve this, the distance between the object and the loupe must be the same as the focal length. If the focal length of the loupe is 25 cm, the distance between objects and loupe is 25 cm. Conversely, when the eye sees a virtual image at a distance of 25 cm (near point), the eyes accommodate maximum or ciliary muscles in the tensest condition. If the focal length of the loupe is 25 cm, then the eye sees a virtual image at a distance of 25 cm when the object distance is the same as the calculation result below. The loupe is a convex lens so that the focal length is positive. The virtual image so that the image distance (di) is negative. If the focal length of the loupe is 25 cm, the eye sees a virtual image at a distance of 25 cm when the distance is 12.5 cm. The distance between the object and the loupe should not be less than 12.5 cm because the eye can not see the image produced by the loupe. What if the focal length of the lup is 50 cm? 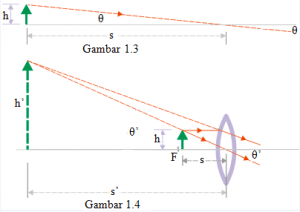 If the focal length of loupe is 50 cm, the eye sees a virtual image at a distance of 25 cm when the distance is the same as the calculation result below. If the focal length of the loupe is 50 cm, the eye sees a virtual image at a distance of 25 cm when the object distance is 16.7 cm. The distance between the object and the loupe should not be smaller than 16.7 cm because the image produced by the loupe cannot be clearly seen by the eye.